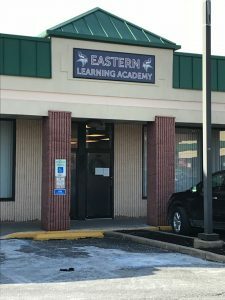 Eastern Learning Academy (ELA) is an off-site program, designed for students struggling with depression and anxiety, that is part of the Eastern Camden County Regional School District. The program serves 20 to 22 students, who benefit from a small group and independent study learning structure. Students have full access to Eastern Regional High School sports, activities and clubs. The program is taught by both special education and general education teachers. Students are supported by a school social worker as well as an instructional assistant. Students also have the opportunity to take online courses to ensure they meet graduation requirements. Students benefit from counseling and a non-judgmental, safe and nurturing setting, and they have the opportunity to transition back to the high school for academics if they so desire. Students at ELA are offered technology such as iPads, computers and Smart Boards. They engage in yoga to help relax and meditate to find balance in their lives, and there is a vast amount of family intervention and education offered. Students are generally working on grade-level courses, and most are classified due to emotional issues, not necessarily learning disabilities. ELS offers a nurturing environment and challenging curriculum based on the New Jersey Student Learning Standards, which they may not have access to in an out-of-district placement. Nominated for the 2017 School Leader Award.